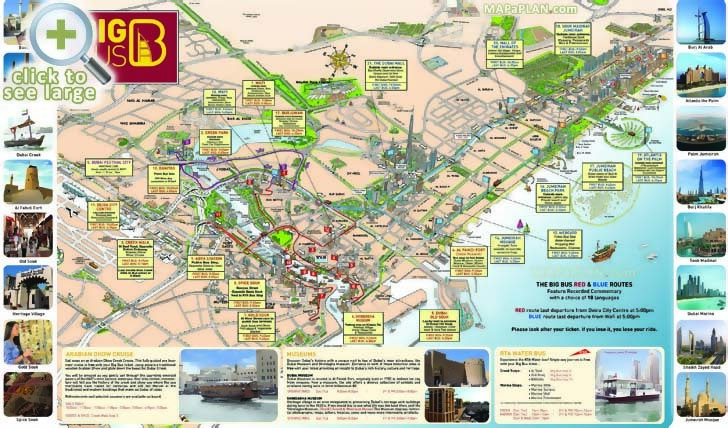 Dubai maps will guide you to the must-see places in this unique city. There is a lot to see as the city is one of the richest and most opulent tourist destinations on the planet. In fact, it is a place where architects and engineers can materialise some of their boldest adf glitzy ideas. 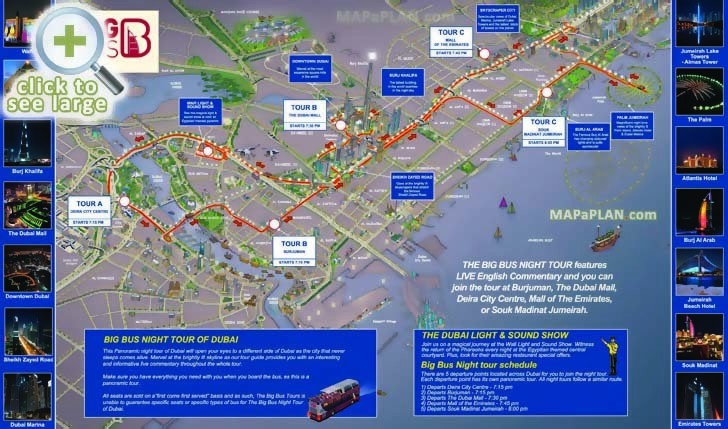 From cultural excursions to family fun days, Dubai has a wealth of locations just waiting to be discovered. With luxurious hotels and some of the tallest buildings in the world, the Dubai skyline is an impressive display of architectural creations against a backdrop of some of nature's most stunning displays. However, scenic backdrops and mile-high skyscrapers are only a fraction of Dubai's appeal. 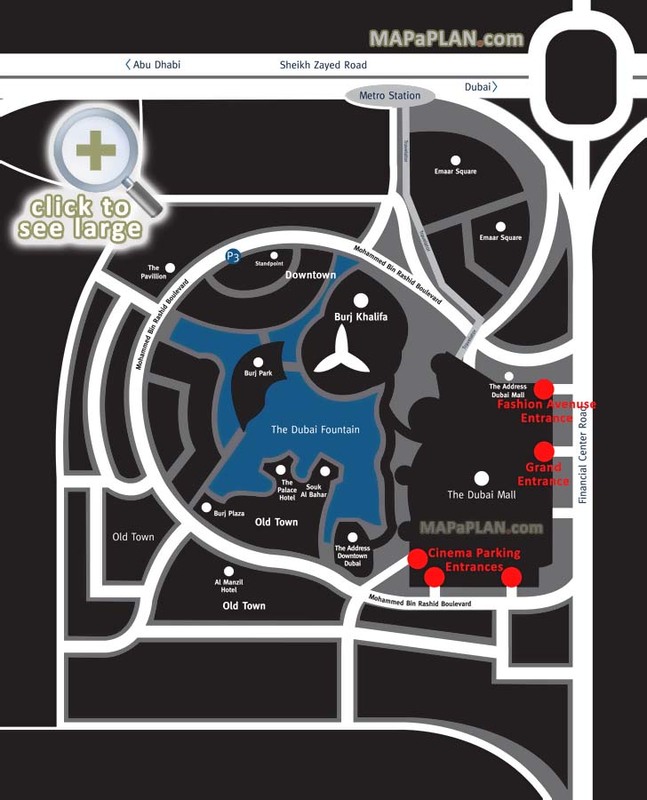 With the help of our maps you will not only be able to learn about the most interesting sights, but you will also be able to find the detailed locations of the major travel destinations including Burj Al Arab, Burj Khalifa, Dubai Fountains, Dubai Mall, Atlantis Hotel, Global Village, Palm Island, Creek, Ski Dubai, Marina, Mall of the Emirates, Jumeirah Beach, Deira Gold Souk, The World Islands, Shopping Malls, Wild Wadi, Dubai Eye, Miracle Garden, Sheikh Zayad Road, Al Bastakia (Old Dubai), Dubai Museum, Jumeirah Mosque and many more - just click on a selected map to access a high resolution version that can be downloaded and printed; or saved onto your mobile device. 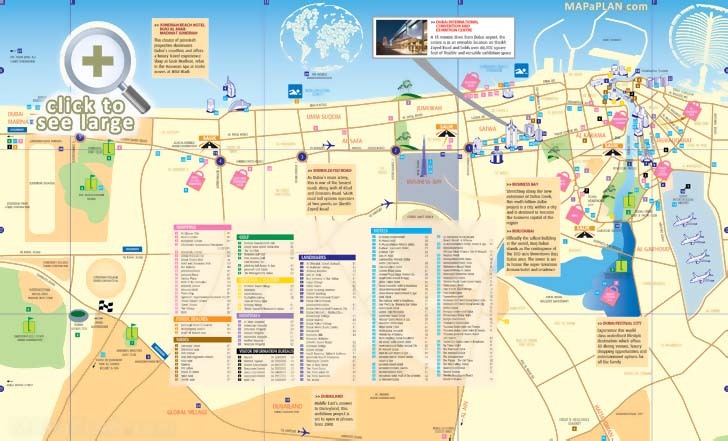 What are some interesting facts about Dubai? Foreigners make up most of Dubai’s population! The local people, called Emiratis, are just 15% of the total! The tallest building in the world, the Burj Khalifa, is in Dubai. It has 164 floors! The above ground metro station opened in Dubai 2009. It consists of 42 stations and was built in just 18 months. Yes, they built an entire system is less than two years! Dubai asked Disneyland to consider building a resort here and Disneyland turned them down, saying Dubai was too small. 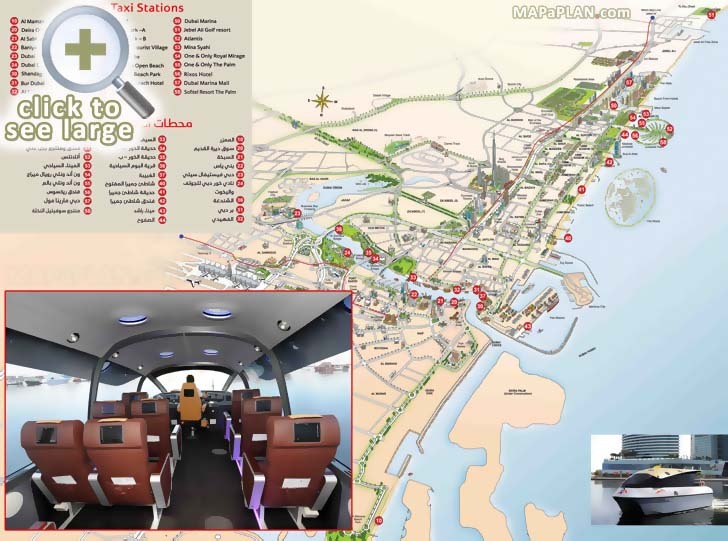 So Dubai decided to construct its own theme park called Dubailand. Dubai has many man-made islands. One of them has a shape of a large palm tree!